As anyone working in the luxury fashion industry will know, China is an important market, with close to a third of global luxury spending coming from the country according to McKinsey - and that is increasing year on year. Here at EntSight we have worked with leading luxury brands in order to help them understand Chinese consumers and in all projects have identified several factors which are key to success. 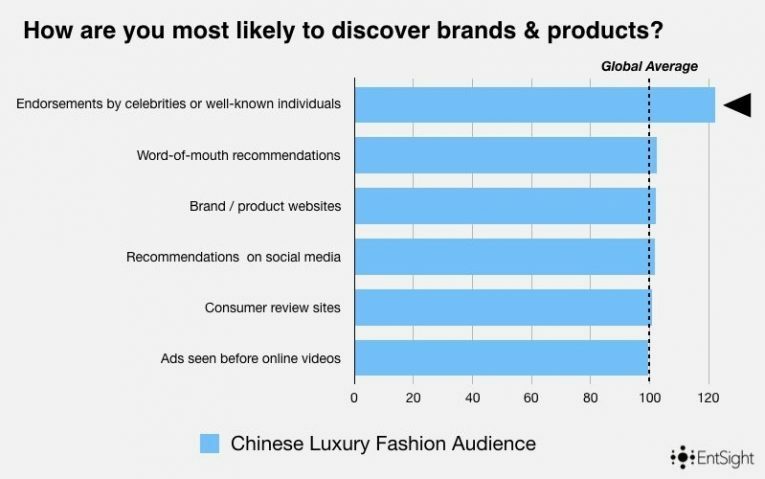 In this article we will explore three key areas - Endorsement, Recommendation and Relevance which have a significant impact on how brands are discovered and talked about by Chinese Luxury consumers, and explore the audience data which supports these. Whilst celebrity endorsement is a strong factor in driving Luxury brand and product awareness globally, in China the effect of these kinds of partnerships offer brands a direct route to ROI with Celebrity content on e-commerce platforms such as Tmall and Taobao regularly responsible for peaks in sales for luxury brands. Alongside Western and Asian Celebrities another group known as Key Opinion Leaders (KOL’s) who are influencer specialists in categories such as Fashion and Cosmetics also drive ROI here, especially when it comes to the Consideration stage of the customer journey where more relatable personalities strongly influence luxury product purchase. As one of the few brand consultancies with access to social conversation data from Chinese platforms such as Sina Weibo we at EntSight are also well placed to identify the best Celebrities and KOL’s partners for your Luxury brand. 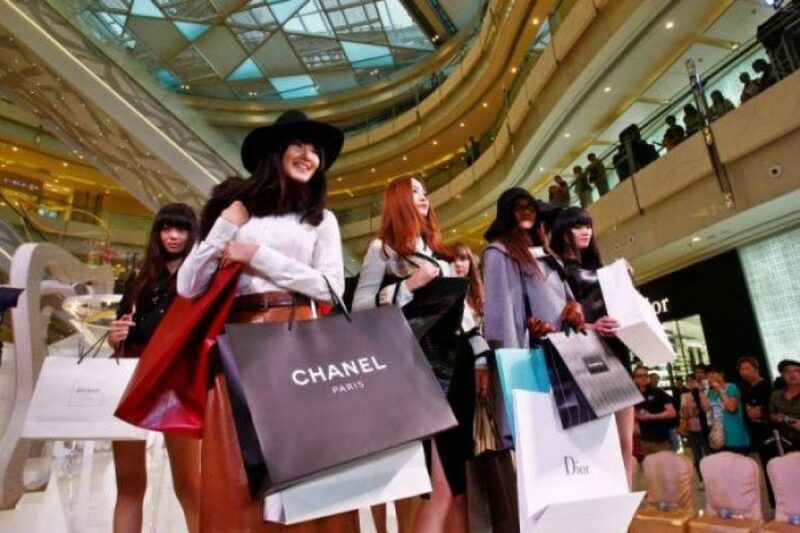 Maintaining a base of loyal customers is as much a need in China as it is anywhere else, however competition between Luxury brands in this lucrative market is strong and so a focus on customer retention is even more key here. 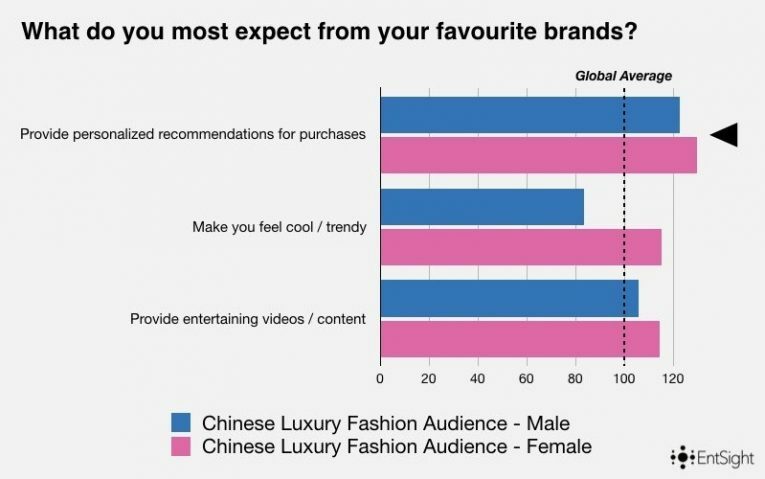 As the Chinese Luxury consumer data above shows, providing personalised recommendations is a key requirement for Chinese luxury consumers, especially females. With this in mind we recommend providing direction via tools and features on owned assets such as websites and smartphone/tablet apps to enable Chinese consumers to match your products with their personal style. In a market where word of mouth and recommendation plays such a key role in driving ROI for Luxury brands then consumer advocacy, either to friends, family or social media connections is absolutely key to the success of campaigns and strategies. 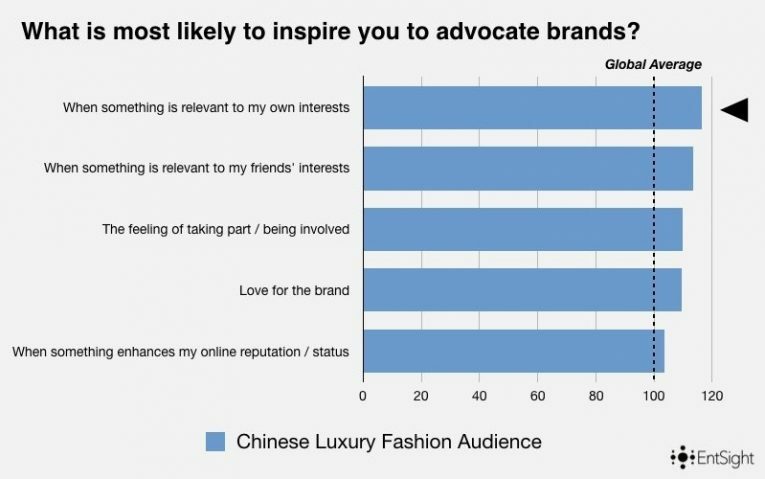 Analysis of Chinese Luxury audiences and what causes them to advocate their favourite brands confirmed that relevancy to both their interests and those of their friends was the most prominent factor here. In real terms this means that campaign content from Luxury brands ideally should reflect the real life interests of audiences, especially when it comes to social and digital channels where affluent younger audiences are most active. Mapping out the interest and behaviours of brand audience groups is a key part of our work here at EntSight and we’ve seen many client success stories as a result of content which responded directly to these.